highly talented students of the Kerry School of Music are joining the School of Music teacher association in September and will be teaching Violin, Piano and Singing in St. Patrick’s Hall, Upper William St. Listowel on Saturdays from this September. 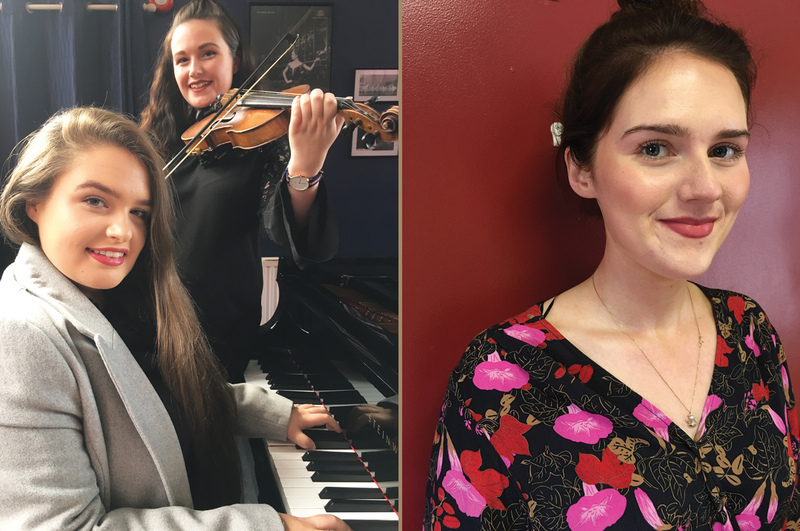 Daughters of Sean and Margaret from Tarbert, Caitriona is beginning the Bachelor of Music Course in CIT Cork School of Music while Mairead is in her final year in the Bachelor of Education course in Mary Immaculate College, Limerick. Both girls studied singing with School of Music Director Aidan O’ Carroll and Violin with Dovile Baltoniene. Caitriona also studied piano with Aidan. teaches Concert Flute and Button Accordion while another newcomer, Emma Tarrant (pictured below right) from Lisselton will teach singing and direct the Listowel Children’s Choir. “The people of Listowel and North Kerry have always prized educational opportunity and have placed great store on the arts” says Kerry School of Music founder and Director Aidan O’ Carroll. “Listowel is the third largest centre of Kerry School of Music after Tralee and Killarney”, says Aidan. “And we note with particular interest the quality of student we get in North Kerry. We look forward to celebrating our 30th year in Listowel in 2019”.